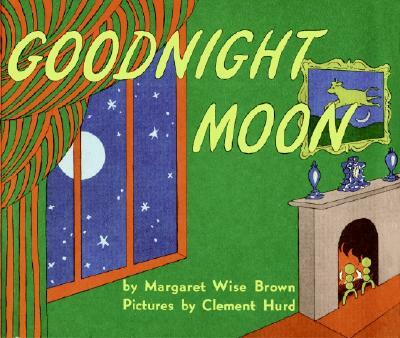 An addendum to my last post: When it comes to books whose appeal I didn’t understand before I had a child, #1 on the list has to be Goodnight Moon. GM completely escaped me growing up–I don’t remember ever having seen it before I was an adult. I read it a few times over the years in book stores, trying to figure out why it was a classic, and failing. To me it seemed strange yet boring, an odd trick to pull off. Someone gave us the book when Galatea was born, and it was one of the first books my wife read her to sleep with. The key thing I noticed was that it worked. Gal fell asleep, usually before the book was done. So I tried it myself. Whereas other books left her wanting more, Goodnight Moon had Gal unable to fight off the sandman. At first I thought the book was boring her to sleep, but as I read it to her night after night (hey, if it works it works) I realized it was the placid strangeness of the text and pictures that had the effect of hypnotizing her to sleep. Entertaining books are a dime a dozen; soporific ones are rare gems indeed.